Stephen A. Balazovich, 92, formerly of West High Street, Coaldale, died July 9 in Bethlehem. Prior to retiring in 1982, he was a tubing operator for U.S. Steel, Fairless Hills. 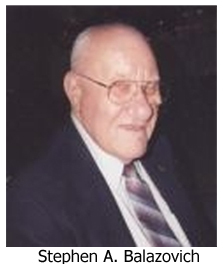 Born in Coaldale, he was a son of the late John and Mary (Cech) Balazovich.He was an Army veteran of World War II. Balazovich was a member of SS. Peter and Paul Catholic Church, Tamaqua. A 1938 graduate of the former Coaldale High School, he was a 50-year member of the Coaldale V.F.W. Post and was a member of the Coaldale American Legion Post, the Coaldale Lions Club, the St. Vincent dePaul Society and the Father Henry Baker Council No. 2711, Knights of Columbus, where he earned a fourth degree. Surviving are a sister, Margaret Boran of Hamburg; a brother William of Maple Shade Meadows, Nesquehoning; nieces and nephews, Jack Boran, Patricia Scutta, Anne Tarsavage, Marie Werley, Peggy Hain and Kathy Boran; and great-nieces and great-nephews. He was also preceded in death by two sisters, Rose Aronne and Mary; and three brothers, Joseph, Michael and John. Service: Mass of Christian Burial 11 a.m. Friday, July 13, SS. Peter and Paul Catholic Church, Tamaqua, with the Rev. William Linkchorst officiating. Interment, SS. Cyril and Methodius Cemetery, Nesquehoning. Call 10-11 a.m. Friday in the church. Arrangements by Gulla Funeral Home, 130 E. Ridge St., Coaldale. Contributions in his name may be made to the St. Luke VNA Hospice House, c/o Administrative Office, 1510 Valley Center Parkway, Suite 200, Bethlehem, Pa. 18017. Online guestbook can be signed at www.zrgfuneralhomes.com.